As you probably already know, Facebook messenger is a great tool for businesses that can help facilitate growth. Facebook Messenger allows business owners to make stronger connections with customers by building relationships through conversation. According to a survey conducted by Facebook, 69% of users say that being able to message a business helps them feel more confident about the brand. Messenger has made some updates over the past several months, including offering messenger bots to automate responses being sent from your Facebook page. (If you’d like tips to help improve your messenger bot, check out this blog post). Your page’s response rate is the percentage of messages that you or other page managers respond to. A message counts toward your Page’s overall response rate if it is the first message that a person sends to your page after neither you or the sender have sent messages for at least 24 hours. The overall response rate of your Page is based on messages received in the last 30 days prior to the last message that counted toward your response rate. For example, if it’s November 6th and the last message your Page received was on October 30th, then your Page’s response rate is based on messages that occurred from October 1st to October 30th. If your Page has received less than 10 messages in this span of time, your response rate will be based on the last 10 messages it received. If your Page has received less than 10 messages total, it will be based on all messages ever received. The response time of your page is what gives people an expectation of the amount of time it will take you to respond to their messages. Just as with response rate, a message counts toward your response time if it is a response to the first message a person sends to your page after neither of you have sent messages for at least 24 hours. So, if you are in a conversation with someone and you respond to each other within 24 hours, that will not count toward your response time. It seems to reset for a conversation after 24 hours of no contact. The response time of your page is an average of the fastest 90% of response times to messages received in the 30 days prior to the last message that counted toward your response rate. For example, if it is November 6th and the last message your Page received that counted was on October 30th, then your Page’s response time is based on messages that occurred from October 1st to October 30th. What messages are included in my Page’s response rate and time? Any message replies that come from your Page manually or via API (like from a bot) are included in the calculation of your Page’s response rate and time. What messages are not included in my Page’s response rate and time? 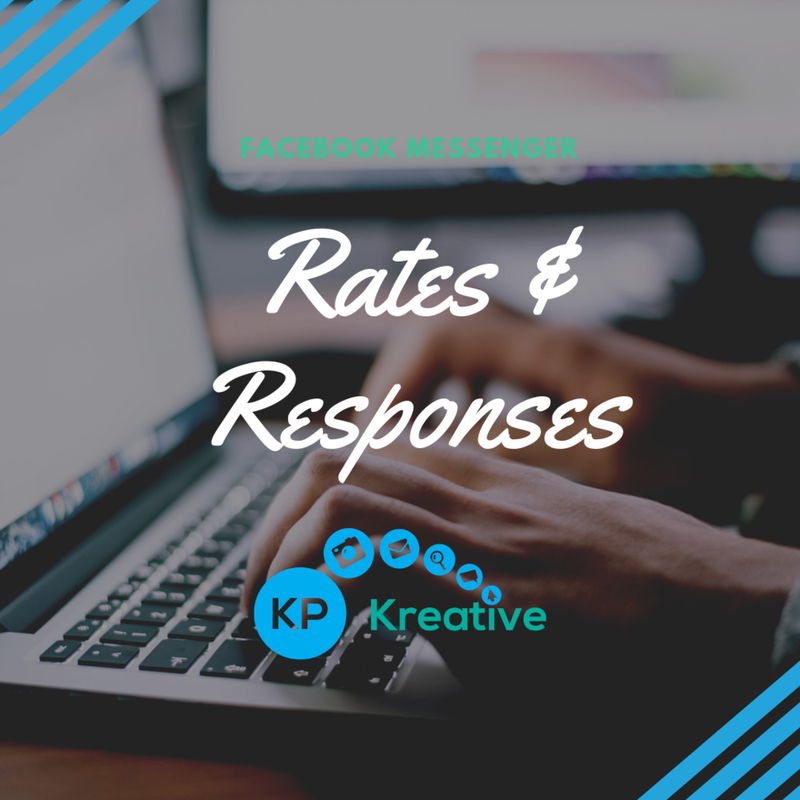 Understanding how Facebook messenger measures your Page’s rate and response time will help you create faster and stronger connections with those following your brand. Do you have more questions about Facebook messenger? Let us know in the comments!